Hundreds of years ago, buildings were thought of much more simply—as shelter, meant to protect people from the elements. Today, that purpose holds, but the technology, practices, and materials that go into high-performing building enclosures have evolved to do more. Assembly components like continuous insulation (CI) and air- or water-resistive barriers (WRBs), once considered progressive practices, are now a requirement across the country. There are still challenges associated with continuous insulation and water-resistive barriers, including maintaining continuity. Anticipating and addressing this challenge when designing details requires constant application of building science fundamentals and an in-depth understanding of a wall system’s materials, layers, and performance. It is the junctures, or transitions, in building detail design that matter most. Improper design of these transition details can lead to some of the most common, detrimental, and expensive issues in wall assemblies: leaks and thermal bridges. Before examining complete wall system design, it is important to review foundational concepts in building science and how they are addressed at each of the layers within a wall. Additionally, it is necessary to evaluate the performance of these layers by testing wall assembly components separately and together. While essentially a review, these aspects are important to reconsider each time details are designed. A wall system is essentially an assembly of multiple components or layers. Forming the base of the wall is a structural system, which could be any of a variety of construction types, such as steel stud with gypsum sheathing, wood stud with wood sheathing, or concrete masonry unit (CMU). The next layer is a cavity containing multiple products, followed by cladding, which can be brick, CMU, stone, metal, or aluminum composite materials, to name a few. 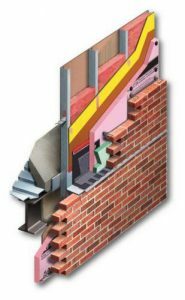 These components ultimately create the cavity wall. Within this cavity wall, the most important aspects of building science and performance are addressed: air and water management, thermal comfort, vapor control, fire resistance, acoustic isolation, and structural considerations (such as how insulation and cladding are attached to the wall).